This new optical device forms virtual images that appear to float in the air. In combination with a contact-less airflow detector, it provides a new method of interaction. The floating image reacts when users blow air into it. 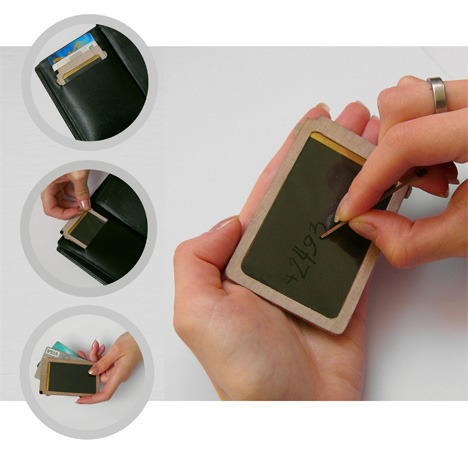 An LCD screen is transformed into a BiDi (bidirectional) screen to support 2D multi-touch and walk-up 3D gesture interaction. The idea behind FlexTorque is to reproduce human muscle structures that allow us to perform dexterous manipulations and interactions. 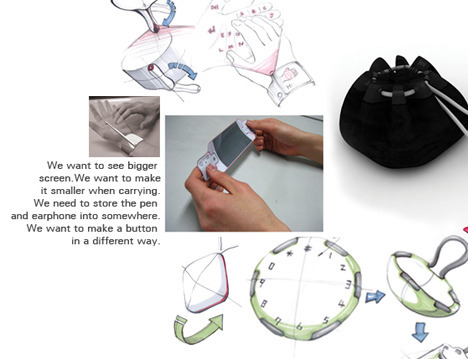 The result is a wearable haptic interface that presents realistic kinesthetic stimulus to the human arm. Fur Display presents touchable fur with surprising dynamic movement. The device is simple and small, so it can be placed on clothing, appliances, or personal belongings, where it becomes a useful, friendly interface in our daily lives. 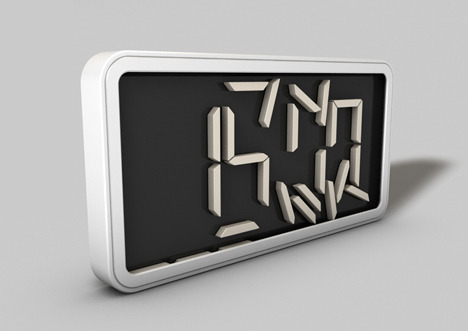 Lumarca (latin for “light box”) is a truly volumetric display that allows viewers to see three-dimensional images. The system requires only a computer, a projector, and common materials found at most hardware stores. MemoIcon increases productivity with a new interaction method based on pattern recognition and multi-touch techniques. It easily binds virtual information to everyday real objects and transforms them into physical icons that embody virtual tasks as tangible items. 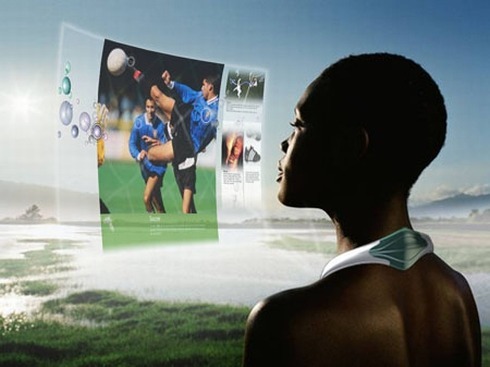 Virtual information becomes tangible and physically present. 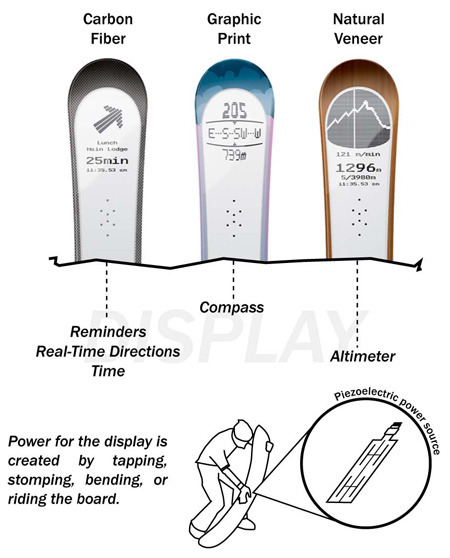 It enables input based on direct touch, force, and shape transformation. Because the soft material is “crash-worthy”, the controller can even be thrown. This prototype is comprised of a pocket projector, a mirror, and a camera. The hardware components are contained in a pendant-like wearable device. The projector projects visual information on walls and other physical objects, which become interfaces, while the camera recognizes and tracks the user’s hand gestures and physical objects using computer-vision techniques. Check my updated story about SixthSense at Touch User Interface. This demonstration combines the cubtile, a new 3D multitouch device that expands tactile input from surface-only interaction to full-volume manipulation, with an augmented-reality-like setup that blends interaction and visualization spaces to put 3D objects between the user’s hands. This prototype system employs a laser range finder to determine the distance to a given object. Users can feel the shape of the object in real time even though it exists inside a glass case. The Volume Slicing Display enables interactive exploration of volumetric data (for example, medical images) using a piece of plexiglass (or paper) that functions both as a control interface and a passive, untethered projection screen. Hmmm.. Laser pointer is a multitouch for robots. Cool and creative. While in real life we don’t need to understand the Newtonian laws to be able to use them, in the software world it is not that simple. Since there is no natural gravity within the computer, the Newtonian laws don’t apply naturally either. We need to introduce physics into the GUI. It’s one of projects I’ve been interested in. But it seems that they’ve almost ceased business (or was acquired by MS??). Intel’s latest upbeat notebook design concept is definitely something to look forward to. Stop guessing about the design as it is beyond guessing. To beat the two screens notebook model, Intel has brought a revolution in the field of touch-screen technology. Its latest model has three mini touch-enabled displays apart from a primary 15.4-inch display. Quite revolutionary, isn’t it? The three mini touch screens are located horizontally just above the keyboard. 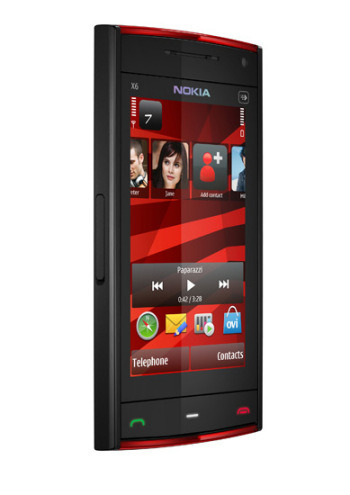 One regular LCD screen plus three supplementary OLED screens enable the user to switch between his multiple documents. The user can easily handle more than one tasks at one go. The unusual idea makes it possible to keep an eye on three mini screens and flip the content from one particular mini screen to the main LCD screen. The purpose of the Intel’s Quad-Display Touch Notebook Concept is to make user possible to manage his or her work in the most orderly and methodical way. 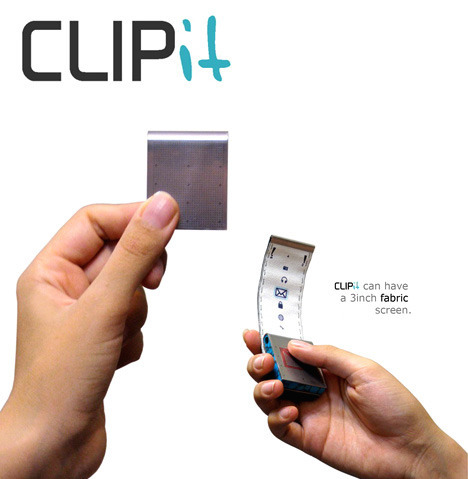 Dragging or flipping all kinds of files from mini screens to LCD screen is as easy as ABC. A touch of a finger and you are done. Apart from flipping documents, Intel’s multi-touch notebook also enables one to contract, zoom, scroll, and pan content from one screen to another. Until the invention of Intel’s Quad-Display Touch Notebook, multitasking was tedious when it came to handle more than one task on the regular one display notebook, but not anymore. Intel’s latest discovery’s three OLED additional screens with the main LCD screen are surely like icing on the cake. It is time to be systematic in a smart way. It is time to look forward to feel four screens of a fabulous notebook design. Microsoft filled a patent application of an adaptive multi touch keyboard. 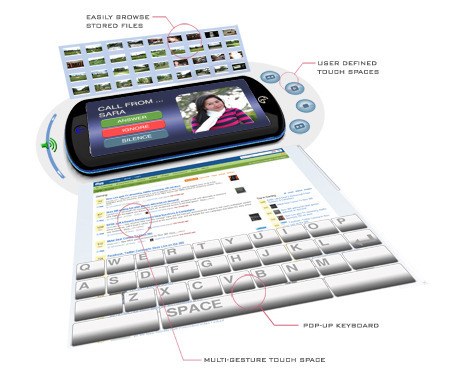 The keyboard, as the patent claims, adjusts its layout according to a user’s hand position. Compare it with Apple’s virtual keyboard patent for iPhone. Roughly speaking, Microsoft’s keyboard is suitable for large multi touch displays while that of Apple is good for mobile devices. Microsoft has introduced a new tablet concept called "Courier". Microsoft’s Courier is a device with dual 7-inch touch screens that enables one to jot, doodle, and flip with stylus. More than a tablet, it is a booklet with a camera at backside. Microsoft is in the procedure of developing this astounding device to enhance its features so that gadget-lovers will fall in love with this multitouch mechanism. Though Courier does not come with any kind of tangible or virtual keypad, it is highly user friendly due its inbuilt handwriting recognition software. Its inbuilt camera and Wi-Fi connectivity surely make it stand in crowd. Courier is definitely an elegant journal which makes it possible to manage your documents with ease. You can easily save your documents including web pages, notes, photographs and other kind of information. Courier will enable users to install various applications supported by this device. Till now all the photographs and videos giving the demo of Microsoft’s new product are denoting the exciting features of this device. Courier has already created quite a stir among the target audience, little more wait and soon the device will be available in the market. Microsoft’s Courier booklet has more than one could have imagined. Recent videos that are available for curious people out there give a complete demo of the device. The demo explains all the features of the digital scrapbook. Organized folder arrangements, easy search option, multiple web pages browsing and easy downloading are some of the user-friendly features of Courier that will make it simpler to manage your schedules and plans. We can say that courier is a huge virtual diary that uses digital ink. One can publish the data from Courier online. The hinge between the screens is used as a compartment to put items you want to shift from one page to another. The battery life and signal can be verified by looking at the edge of one of the touch screens. Courier will surely unearth more of its irresistible features in the coming future, till then we can’t help but wait. The concept of dual-display tablets is not new, but it's important that OS giant Microsoft now has really interested in it. As pointed by many resources, it seems to be a descendant of Microsoft’s Codex and InkSeine Project. 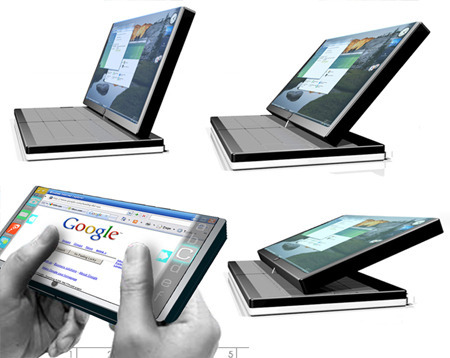 As for bonus links, I list down my previous posts on dual-display laptop and tablet concepts. The Touch Color Concept is the innovation in the world of assistive technology to prove that creation of art does not necessarily require eyesight. A Thermal digital tablet and a Rainbow Color picking ring in this gadget enable a blind person to paint his imagination on the tablet with his fingers. The tablet makes it possible to sketch and paint beautiful digital pictures. The rainbow picker in this device has 24 vibrant shades. One can scroll the ring to choose the color. Color can be identified by sensing the Braille dots on each color. The rainbow picking ring can be captured with the help of the fingers. The ring can be scrolled to select any color from 24 shades. The Braille dots on the shades help to identify different colors. 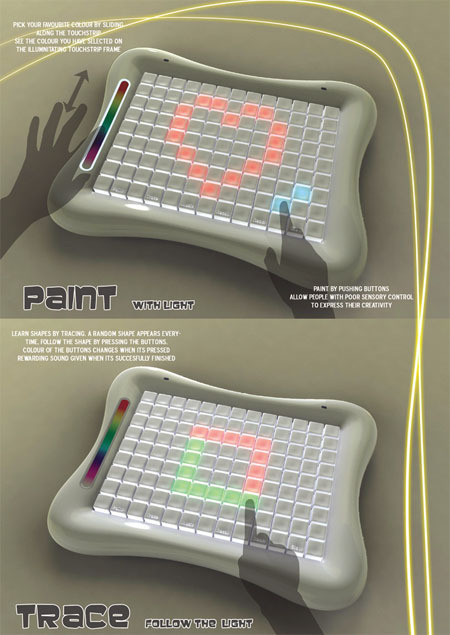 Further, the gadget makes a distinction between colors by producing diverse temperatures due to LED bulbs. It is nothing but the touch of technology that transforms color from the rainbow ring on to the thermal drawing board. When a blind person selects color on the ring with the help of his finger, the thermal-color display technology makes him possible to visualize the outlines of a picture and colors rightly. The color gets transmitted on the tablet and one could draw with his fingers. One can use Braille stylus to outline the picture and paint like a pro. The thermal board has a cavity that holds the rainbow ring in place while drawing. The switch button enables to study the surface of the tablet and to create the picture due to its study mode and creation mode. The picture can be saved, deleted and transferred easily. A hearing device on the tablet instructs the painter to help him come up with a near to perfect artwork. 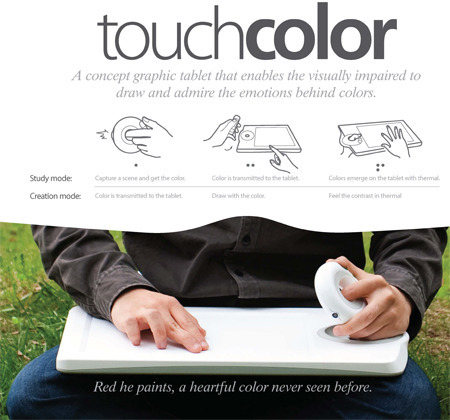 The Touch Color Concept is a must have device for those who are suffering from color blindness. 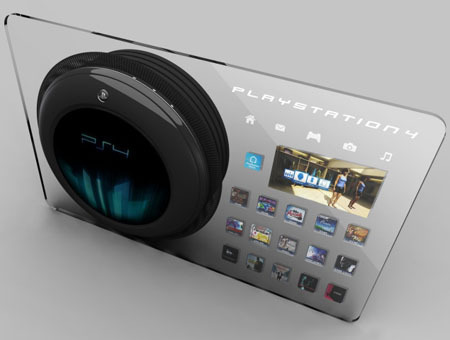 The touch screen technology has gone beyond the senses with this ground-breaking invention. All credit goes to the master minds behind this new age gizmo - Yun Li, Guopeng Liang & Ke Zhao. It is an era to paint with the soul and not with the eyes. Link: What will it take to make you wanna touch? Smoothboard 1.6 is a Wiimote Whiteboard \ Wii Whiteboard software that contains a customizable floating toolbar that allows effortless control of your presentations. The built-in annotation feature allows you to write and highlight directly on top of any application or document. You can also create snapshots of the screen automatically with Smoothboard. 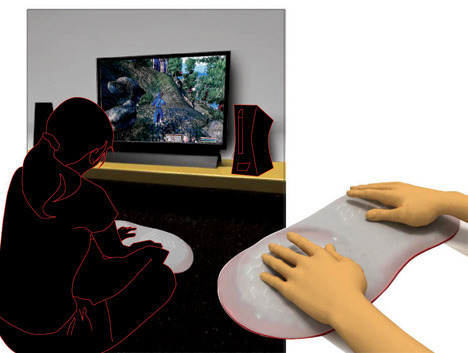 Systems, methods, computer-readable media, and other means are described for utilizing touch-based input components that provide localized haptic feedback to a user. 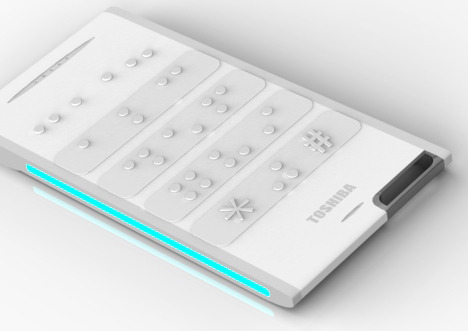 The touch-based input components can be used and/or integrated into any type of electronic device, including laptop computers, cellular telephones, and portable media devices. 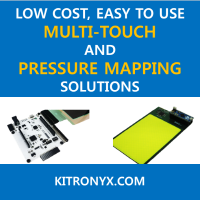 The touch-based input components can use, for example, a grid of piezoelectric actuators to provide vibrational feedback to a user, while the user scrolls around a click wheel, slides across a trackpad, or touches a multi-touch display screen. 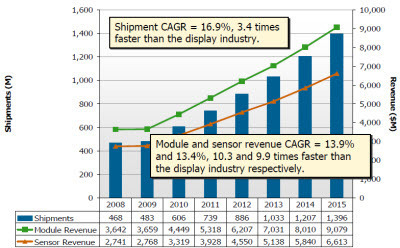 Based on each Panel makers’ technology development strategy and product lineup plan, the newly published Displaybank’s Report analyzed market ramifications from corresponding technology as well as new product development plan. The Report is divided into 3 Parts including TV & PID, NotePC and LCD Monitor that is anticipated to benefit all companies involved in Display supply chain including Component makers, Panel makers and Set makers. 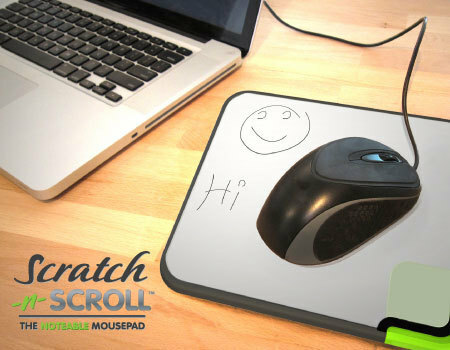 Another low tech touch pad. SmartFinger is a program that allows you to enter text easily and conveniently using a terminal with touch screen and Windows Mobile 5 or higher versions.